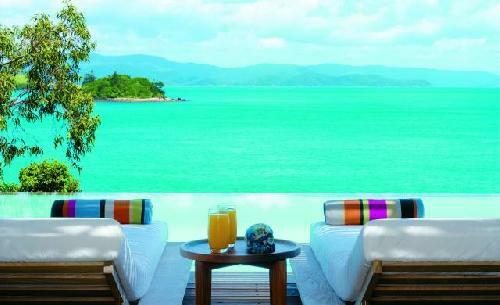 Guests who are looking for luxury hotel accommodation on Hamilton Island should look no further than the qualia resort. The property is ideally positioned at the northern most tip of Hamilton Island and provides a secluded escape that is surrounded by the majesty of the Whitsundays. With quality facilities and luxurious amenities qualia not only provides accommodation with a difference but also caters for people with active bodies and minds. With a relaxed atmosphere the Qualia Hamilton Island some how manages to make time seems to stand still, whilst allowing guests to make the most of the sun-drenched location and intuitive service provided by the friendly staff. For those people who are looking for a reall romantic getaway why not charter the qualia's own luxury vessel and discover & explore the magnificent Whitsunday islands, the clear blue waters of the Coral Sea and white sands of Whitehaven Beach. With a selection of luxuriously appointed 1 bedroom hotel suites the Qualia Hamilton Island provides that ideal place to take in the natural beauty of the Whitsundays and let the cares of the world melt away. At the qualia Hamilton Island that is a huge range of resort style facilities for guests to enjoy including 1 infinity edge swimming pools, 2 restaurants, library, a fully equipped gym and fitness centre, luxurious day spa, fashion boutique, room service, business centre and free water activities including kayaking, catamaran sailing and snorkeling. With luxury Hamilton island accommodation comes a raft of luxurious activities that you can try when staying at this resort including soothing spa treatments, relaxing by the many island pools, playing a round of golf on one of Australia's premier courses, taking a chartered cruise, beach drop-offs or pampering yourself a Spa Quila. Also Hamilton Island has over 60 different activities to choose from when holidaying in the Whitsundays, such as exciting water sports, adventure activities, day trips to the Great Barrier Reef and nearby Whitehaven Beach, snorkelling around the reef, jet skiing, sea kayaking, bushwalking, scuba diving or exploring the entire island in a golf buggy.